Home » Events » SISTERS OF THE CORN! Join us as everyone’s favorite neighborhood bar, R Place, for fun with friends and the best libations in Seattle. Be sure to arrive early as this event is going to be the hottest place to be in Seattle on Halloween night! And to top off the night there is a costume contest! 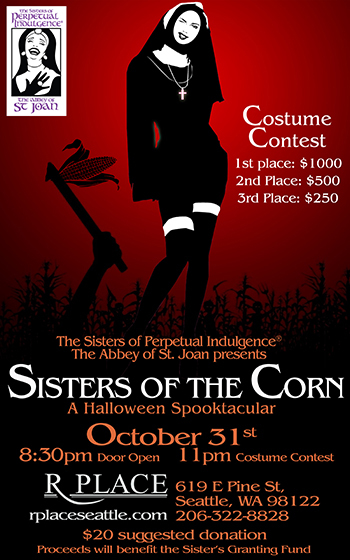 Sisters will be judging all the costumes, and at 11pm the winners will be announced from the 3rd floor stage. And the best costume will walk away with $1000 in their pocket!